All the online forms data you receive throughout the day can now be automatically submitted to your Power BI real-time dashboards directly from the pro-Forms® system. We got in touch with senior managers, business analysts and Directors who use pro-Forms® to ask them what they do with their data. Their responses were illuminating to say the least! On average, our feedback suggested Users were spending a minimum of 2 hours a week exporting data from pro-Forms® to upload elsewhere. Interestingly, nearly all the respondents said they wanted a simple, visual summary of what their data was really telling them across different functional areas of their business. We put our heads together and decided to solve need this by creating a brand new pro-Forms® connector for Microsoft Power BI. Why use your valuable time generating your monthly reports when you can seamlessly integrate your incoming online and mobile form data with one of the best data visualisation tools out there? It's time to put an end to manual reporting as we say hello to real-time data dashboards. Power BI is a data visualisation tool created by Microsoft. The desktop, web and mobile app act as a platform for uploading and visualising your data. 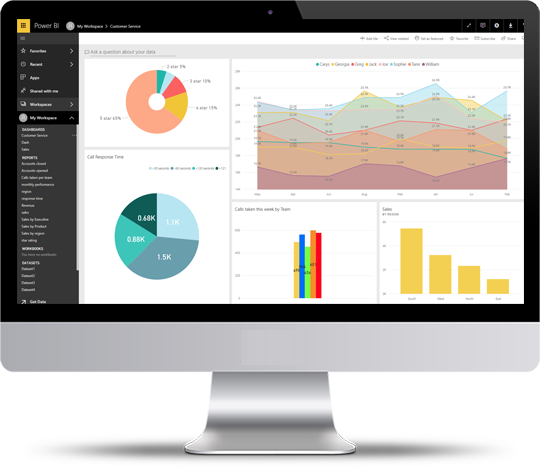 Power BI enables organisations to create multiple dashboards for different activities and areas where data is continually streaming in from the field. You can share and embed your data on your website, in your presentations and on your social media feeds. Conduct surveys? See responses in real-time! If you're like many of our customers who publish surveys online e.g. Customer Satisfaction for ISO9001 compliance, then imagine if there was a way you could see a graphical summary as your data arrives in real-time. With our new connector all you have to do is a one-time configuration for your incoming forms to feed into a chart on your Power BI dashboard. Every submission will automatically feed into your charts so you can monitor the activity throughout the day. This is ideal for customer and research-based roles where data analysis can be conducted in real-time. With Power BI, you can delve deeper into your data and uncover trends, insights and a level of business intelligence simply not possible with typical spreadsheet analysis. Each chart can trace you back to the primary raw data where you can truly see what is going on - for example field worker KPIs, fleet management costs or inventory consumption. Power BI tools allows you to analyse your data over defined time periods for comparison and sharing with colleagues inside and people external to your organisation. To learn more about our exciting new integration with Power BI, head over to our website. Contact us today to start bringing your data to life!